The magic of Disney is coming to the Westchester County Center in White Plains, NY! Join Mickey & Minnie and all their friends for the Disney Live! 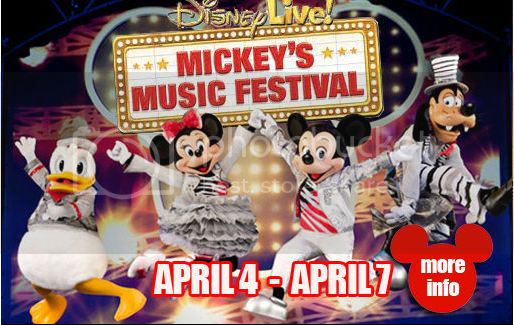 MICKEY’S MUSIC FESTIVAL this week only. After our family’s visit to Disney last year we are definitely going to need this show to get us through to the next time we go AND now you have a chance at taking your family to see the show with us, tomorrow April 4th, for Opening Night! Mickey Mouse and friends rock the world with the stars from The Little Mermaid, Aladdin and Disney/Pixar’s Toy Story in their new touring show Disney Live! Mickey’s Music Festival. Disney hits are remixed to the hottest sounds of today featuring hip hop, pop, swing, reggae, rock, country and much more! The irresistible lineup of performers including Mickey, Minnie, Donald and Goofy; Ariel, Sebastian and Ursula; Jasmine, Aladdin and Genie; and Woody, Buzz and Jessie; are among the more than 25 Disney stars featured in this jam session fit for the entire family! You can’t resist dancing, singing, playing your air-guitar and laughing with this band of characters! Come join them at Disney Live! Mickey’s Music Festival for a lively concert experience guaranteed to deliver enough rockin’ memories to last a lifetime. April 4 – Thursday 7 p.m.
April 5 – Friday 7 p.m.
April 6 – Saturday 11 a.m., 3 p.m. & 7 p.m.
April 7 – Sunday 1 p.m. & 5 p.m.
Children (ages 1-12 yrs.) $20 in the $40 & $30 sections. Ages one and older require a ticket. 2 for 1 Ticket Deals for the April 4th & 5th shows!!! – Save 50% when you buy two tickets! READY TO WIN OPENING NIGHT TICKETS?!?! Be sure you can attend the Thursday, April 4th 7pm show & GOOD LUCK!!! Disclosure: Sweepstakes and media tickets were provided by Disney Live however, all thoughts and opinions are always mine!